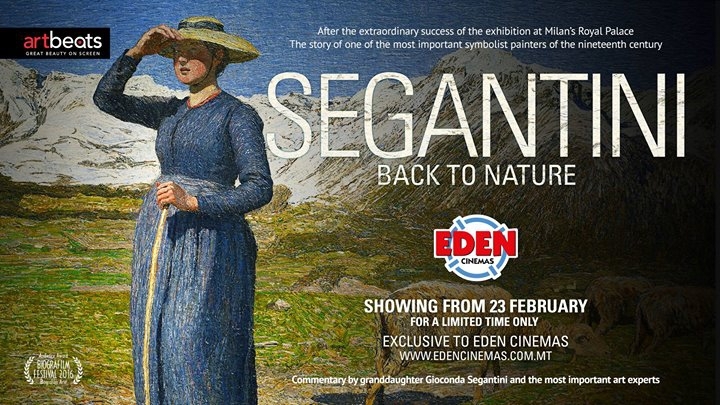 Lovers of art are invited to take an exciting voyage into the life and works of one of the most eccentric artists of the 19th century in ‘Segantini – Back to Nature’, on Eden Cinemas’ screens from the 23rd February. He was an eccentric, a loner, a “mountain bear” who could deeply feel the magnetic strength of the Alps, just as well as the pulsating energy contained in the big cities of the 19th Century. Giovanni Segantini (1858-1899) was one of the great Divisionist artists, an amazing painter with a wild, impetuous nature, but at the same time poetic, gracious and meticulous. Two years after the exhibition at the Palazzo Reale in Milan, which celebrated the impressive beauty of his too long neglected works and drew over 200,000 visitors in 4 months, it’s now time for the big screen to honour one of the most important 19th Century Italian artists, Segantini, a painter ever poised between divisionism and symbolism. Watching ‘Segantini – Back to Nature’ on Eden Cinemas’ multipurpose theatre will be a truly immersive experience, offering a unique opportunity to get up-close to the impeccable work of a true artistic mastermind and his innate capacity to see nature as a fount of artistic, spiritual inspiration..
Tickets are available at €12 for adults and €7 for children under 16.